WHY COMPREHENSIVE EYE EXAMINATION IS IMPORTANT ? Having a comprehensive eye exam each year is the best way to enjoy good vision throughout your life. During a comprehensive eye exam, several different tests and procedures are done to check your vision as well as the overall health of your eyes. A comprehensive eye examination takes about 2 hours , and it consists of most of the following parts. A visual acuity test is a measure of how well you see or the sharpness and clarity of your vision. Your eye doctor will ask you to read letters on a chart at a particular distance. The smallest letters you are able to read will be recorded as your acuity. The vision is recorded for distance and near. This test measures the muscles that control eye movement. It is usually a simple test conducted by moving a pen or small object in different directions of gaze. Restrictions, weaknesses or poor tracking of visual objects are often uncovered. Pupillary reactions (the way your pupils dilate and constrict in response to light) can reveal a lot about the health of the eyes and of your body. The nerves that control the pupil travel through a long pathway within the body. Certain pupillary reactions can reveal neurological problems, including some serious conditions. Your pupil reactions are tested with a very bright light directed toward one or both of your eyes. The cover test is performed to measure how well your eyes work together. The cover test is a simple test in which the doctor asks you to fixate on a near or distant object. He covers one eye, pauses, and then uncovers it. He is evaluating your eye as it is uncovered, as it refixates on the target. The cover test helps to detect crossed eyes (strabismus), lazy eye (amblyopia) or a decrease in depth perception. Most people remember refraction as the part of an exam in which the doctor asks the patient, "Which lens is better, one or two?" Refraction is a subjective test to measure nearsightedness, farsightedness, astigmatism or presbyopia. A series of lens comparisons are shown to you. The doctor will ask you which lens is clearer. The results of the refraction test are primarily what the optometrist uses to develop your final eyeglass or contact lens prescription. Eye doctors use an instrument called a slit lamp, also called a biomicroscope, to examine the front (anterior segment) and back (posterior segment) part of your eye. This is to evaluate the overall health of the eye. crystalline lens and anterior chamber, is examined in a methodical manner to reveal any defects or diseases. Cataracts can be diagnosed using the slit lamp. Tonometry is the measurement of the eye's pressure, better known as IOP, or intraocular pressure. Your eye doctor will put a drop of anesthetic into your eye. He will then place a small amount of fluorescein (yellow dye) into your eye. A small device called a tonometer is moved close to your eye so that it gently touches the cornea, measuring the pressure of your eye. If your eye pressure is higher than normal, your risk of developing glaucoma increases. The dilated fundus examination is usually the last step in a comprehensive eye examination. Special eye drops to dilate your pupils. This increases the size of your pupil, giving your doctor a larger window in which to inspect your internal eye health. 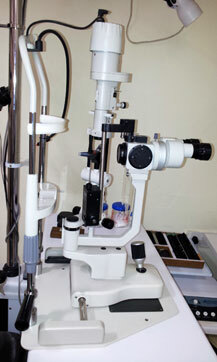 The doctor is able to examine the vitreous, optic nerve, blood vessels, macula and retina. An instrument called a binocular indirect ophthalmoscope (BIO) is worn on the doctor's head. This frees the doctor's hands in order to use a powerful lens to focus light emitted from the ophthalmoscope into your eye. With this instrument, the image is a bit smaller but the field of view is much larger, allowing the doctor to view your entire retina. The dilated fundus examination is a crucial part of an eye exam, as many eye diseases can be detected during the test.